Tamada are the first and only company importing Tbilvino wines to Australia from Georgia. Based on Sydney, Tamada’s objective is to bring the best quality Georgian wines to Australian wine lovers at affordable prices. These wines are great for people who are looking for new and unique wine experiences. If you are wondering how the wine gets to Australia, Tamada brings it using only refrigerated containers and it is then transported to and stored at temperature controlled warehouse to ensure the wine is kept at its premium standard. The country of Georgia is home to an 8000 year tradition of superlative wine production. Georgia is located at the cross-roads of Eastern Europe and Western Asia. An interesting fact is that archaeological and biological evidence confirms that viticulture has its roots in Georgia, with carbon-dating studies of domestic Georgian grape pips confirming this ancient tradition! The longevity of Georgia’s wine tradition has 500 of the world’s grape varieties – 25% of known varieties in existence – are found exclusively in Georgia! The South Caucasus region is thought to be where winemaking was born, with big clay pots (‘Qvevri’) being used for storage and production. Crushed grapes with its skins, pips and stems would be packed inside the Qvevri, and these would be sealed and buried underground as a method of ‘Neolithic’ environmental control, during which natural fermentation, filtration and maturation takes place. The Qvevri would be allowed to naturally ferment over several months, allowing maturation of the final impeccable wine. The long-standing tradition of natural wine-making that is indigenous to Georgia continues to this day. The natural environment of Georgia allows for optimal ripening of grapes to absolute perfection. The cascading rivers flowing from the Caucasus imbues the grapes with an unsurpassed succulence, while the scorching sun permeates a subtle yet provocative flavour. Georgian wines have tremendous diversity, allowing an ancient wine tradition to be savoured by the modern wine connoisseur. Indeed, the natural Georgian viticulture process and high quality of this wine tradition has begun t considerable excitement amongst wine experts, sommeliers and wine lovers across the world! Such wine-making is unique to Georgia and just recently it has been added to the world heritage list of the UNESCO. Recently Georgia has been given an EU go-ahead to use the phrase ‘Cradle of Wine’ on its wine bottles, as an appellation d’origine contrôlée, which it hopes to help promote Georgia as the oldest wine-producing country. Tbilvino’s story begins in 1962 when one of the most powerful wine factories in the Soviet Union was launched – this was the year Tbilisi held its 10th International Congress off Winegrowers. For years the factory remained an essential part of the Soviet wine making industry (9 out of 10 bottles of wine sold inside the country and abroad were made in this factory) In the early 1990s, Tbilvino emerged as an independent wine company with a new philosophy which at the time was radical – that grapes were as essential as wine material. Today this still undergoes substantial development in infrastructure and growing sophistication which flows through its wines. Tbilvino believe that they should be responsible for every bottle of wine made in their company. As a result, they closely monitor the entire wine making process – from the vineyards to the end consumer. Tbilvino’s aim is to create sophisticated wines that make a difference. Tbilvino is one of the pioneers of the new Georgian wine making history and their ambition is to produce top quality wines, even in challenging times. 1999 was the first harvest year. From their starting point in international markets in 2005, our wines were now sold in18 different countries! Tbilvino have also received many awards and accolades. The Tsinandali 2013 is a dry white wine made from a blend of 85% Rkatsiteli and 15% Mtsvane which the grapes grown in the Kakheti region, Georgia. This wine has stone fruit and citrus notes with hints of honey. There are also undertones of oak and vanilla. Only $18.95 a bottle! This wine would be paired with a nice chicken dish. The Qvevris Rkatsiteli is a dry white wine made using Rkatsiteli grapes from the Kakheti region in Georgia. This wine was made using an old traditional “Kakhetian” method by fully fermenting and macerating the grape juice and skins together in a Qvevri (clay amphora buried into the ground) that gives the wine intense colour, deep tannin taste and structure. This wine has lovely pear and citrus flavours with hints of spice. It would be paired well with a spicy Asian dish. $24.95 a bottle a bottle. The Saperavi Rosé 2013 is a dry rosé wine made with grapes from the Kakheti region of Georgia. This wine has lovely raspberry and strawberry fruit flavours with hints of spice. This wine can be enjoyed on a nice warm day. $23.95 a bottle. How beautiful is the colour? This is a result of the high level of tannins and colour in the Saperavi grapes. The wine was left in contact with the skins for only 4 hours before being lightly pressed off into tanks to make the Rosé wine. The Kindzmarauli 2014 is a semi sweet red wine. It is made using Saperavi grapes from the Kindzmarauli appellation of Kakheti region, Georgia. This wine has lovely blackberry and cherry fruit flavours. A delicious sweetness to a typical red. Once Upon A Wine recommends that this wine should be slightly chilled. $24.95 a bottle. 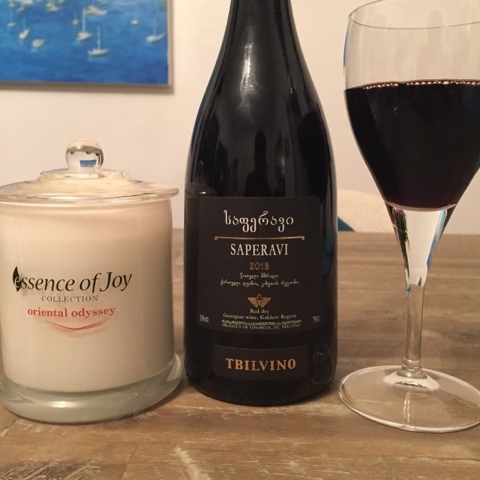 The Saperavi 2013 is a dry red made from Saperavi grapes harvested in Gurjaani and Kvareli districts of Kakheti region, Georgia. This wine has nice blackberry, cherry and plum fruit flavours with hints of spice. It would pair well with grilled meat dish. The name means ‘paint dye’ and is named as such due to its inky purple colour. Saperavi is Georgia’s main red grape variety and is one of a few varieties in the world which has red anthocyanin (colour pigment) as well as pulp in the skin. $23.95 a bottle. The Mukuzani 2013 is a full bodied dry red wine from Mukuzani in the Kakheti region, Georgia. This variety is Georgia’s most famous and well regarded appellation of origin. The wine has nice dark ripe cherry fruit flavours with hints of oak and spice. This wine would be paired well with a nice cut of steak. Definitely worth checking out. Only $24.95 a bottle. A big thanks to Tommy from Tamada for enabling me to experience the world of Georgian wines. Once Upon A Wine highly recommends trying these wines out if you are after something different and traditional. Some lovely drops here and great value for money. Want to contact Tamada Wines? Wines were enjoyed compliments of Tamada Wines. However, the opinions on the wine are my own.